I’ve gone for Cornish pasties to represent England in this year’s World Cup cook-off. Yes, it’s a shameless crowd-pleaser, but I suspect that England needs all the help it can get – both in the kitchen and on the pitch. Strictly speaking, if it’s not made in Cornwall, it’s not a Cornish pasty. But if I’d made these in Penzance instead of London, I think they might pass muster. 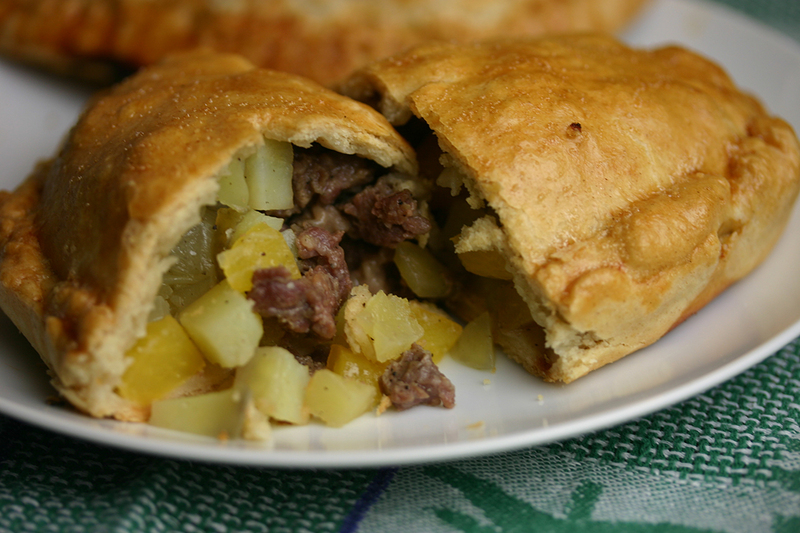 A traditional filling of beef, potato, swede and onion, seasoned with salt and pepper – check. Filling uncooked when folded into the pastry – check. The required D-shape, with a side (not centre) crimp – check. The Cornish pasty recipes I looked at were all pretty similar. These are adapted from this one by the Hairy Bikers. In a mixing bowl, whisk together the flour, baking powder and salt. Rub in the butter with your finger tips. Make a well in the mixture and pour in the egg. Stir with a fork until the mixture starts to come together. Slowly add water, and continue stirring until a ball of pastry forms. Wrap the pastry in clingfilm and chill for an hour. Toss the vegetables together in a bowl and season with salt and black pepper. In another bowl, sprinkle a tablespoon of flour over the chopped beef, season with salt and pepper and stir to combine. Divide the pastry into six equal portions. Roll a pastry portion into a circle about 8″ (20cm) in diameter. Place a sixth of the vegetables and a sixth of the beef on one half of the circle, leaving half an inch (1cm) round the edge. Dot with butter. Brush the edge of the pastry with water. Fold the pastry over the filling and press the edges together, then roll and crimp. Transfer to a baking tray. Brush the pasty with beaten egg, then make a steam hole in the centre with a knife. Bake the pasties for about 45 minutes, or until crispy and golden brown. Cool for ten minutes before eating.